The University of Massachusetts Lowell and a non-profit partner, Machine Science Inc. of Cambridge, Massachusetts have developed a Web-based curriculum for after-school robotics, based on two microcontroller platforms: one for middle school students and the other for high school students. The curriculum, which teaches computer programming and design skills in the context of hands-on electronics and robotics activities, was developed and evaluated as part of a four-year National Science Foundation-funded research project called Building an Internet Community of Design Engineers (iCODE). From 2006 to 2010, the project partners used the curriculum to support year-long academic enrichment programs at middle schools, high schools, and community centers in underserved communities within Boston, Lowell, and Lawrence, Massachusetts. This chapter describes the design and development of the iCODE curriculum, explores the project’s assessment strategies, and reflects on lessons learned from four years of offering after-school robotics for an inner-city youth population. 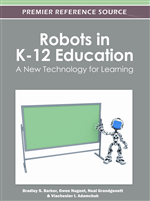 To introduce robotics activities into classroom teaching or academic enrichment programs, a K-12 educator has to put in place a range of resources for his or her students. These include the physical parts and tools needed to build the robots, the electronic components for controlling them, a programming environment for developing code, and instructional materials to help students build their content knowledge and skills. A number of important decisions must be made at the outset. Should students build their robots and control systems from off-the-shelf parts or from commercial robot kits? Should they work in a graphical or a text-based programming environment? Which programming language is best, given the grade and ability level of the class? Once these decisions are made, the teacher faces the additional hurdles of finding or developing project examples, design challenges, and other activities to inspire and motivate the students. Depending on the teacher’s previous experience, facility with engineering and computer programming, and class size, it may be necessary to find a classroom assistant or mentor to help students build and program their robots. Launched in 2006, the Internet Community of Design Engineers (iCODE) project was conceived to help educators surmount these challenges by providing web-based curriculum resources and software, hands-on learning materials, and mentoring support to make it easy for students at different grade levels to get started in electronics and robotics. The iCODE curriculum is based on two different microcontroller platforms: the Super Cricket, created by Fred Martin of the University of Massachusetts Lowell (UMass Lowell), and the Breadboard Microcontroller Starter Kit, created by Machine Science Inc. of Cambridge, Massachusetts. Activities for the Super Cricket, a printed circuit board controller programmed in Logo, are intended for middle school students, while projects for the Breadboard Microcontroller Starter Kit, a build-it-yourself, breadboard-based microcontroller platform programmed in C, are intended for high school and undergraduate learners. The iCODE web site (www.icodeproject.org) offers a sequence of hands-on electronics and robotics activities for each microcontroller platform. With support from the National Science Foundation’s (NSF’s) Information Technology Experiences for Students and Teachers (ITEST) program, UMass Lowell and Machine Science developed the iCODE curriculum and used it to support year-long enrichment programs for more than 200 students from urban school districts in Boston, Lowell, and Lawrence, Massachusetts, during the period from 2006 to 2010. At each program site, UMass Lowell and Machine Science worked closely with one or more educators to carry out the iCODE activities. Teachers received individual on-site guidance in setting up the programs prior to the start of the academic year, and assistance from undergraduate and graduate mentors throughout the year. Mentors helped explain the iCODE content, assisted students with their hands-on projects, challenged students to expand their project ideas, and provided programming and troubleshooting expertise, as needed. By the conclusion of the grant period, many of the participating educators felt comfortable offering the iCODE programs without outside assistance, relying on the project’s web-based curriculum, software, and other features. Enhance the participating students’ information technology 〉uency by showing them how computer software and hardware interact in programmable devices. Increase awareness among participating students about educational and career opportunities in IT and STEM by arranging visits to college campuses and education and career fairs. Connect participants to a community of like-minded peers and adults by giving students the chance to work side-by-side with undergraduate and graduate student mentors and enabling them to share images, videos, and descriptions of completed projects on the iCODE web site.